Available in Clear or Anthracite Grey. Flared design is a perfect touch to these simple bathroom accessories. A perfect coordinated item with any of our rugs or shower curtains from our collection. 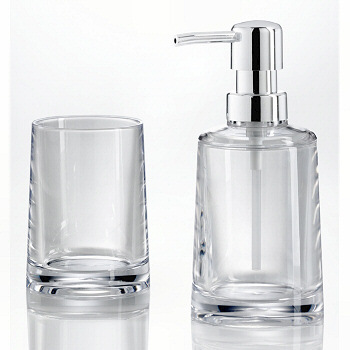 The size options include a tumbler and soap or lotion dispenser. Classy flared design with chrome accents on the dispenser.